Sensitivity is a key performance feature of any detection system. 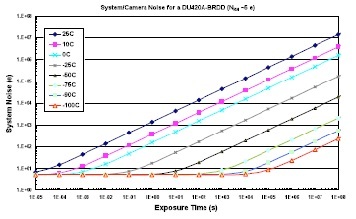 When assessing the sensitivity of any CCD sensor it is the achievable Signal-to-Noise Ratio (SNR) which is of key importance. This encapsulates the capacity to have the signal stand out from the surrounding noise. Figure 1: The detection limit as a function of exposure time for single pixel (imaging mode) which are read out at 33 kHz with readout noise of 4.6 electrons. This function enables the performance of any conventional CCD to be assessed given the values for the key parameters – usually contained in the specification or performance sheets. The degree by which a basic signal is amplified or multiplied is referred to as the gain factor. This can be selected through the software and leads to alteration of the voltages across the MCP in the case of the ICCD and the clocking voltages applied in the EM read out register of the EMCCD. It can be seen here that by increasing the gain G, the term involving the read-out noise, NRN, becomes insignificant compared with the intrinsic shot noise of the signal, leading to ultra-sensitive detection capability. EMCCD and ICCD systems operated with appropriate configurations with sufficiently high gain can be used for single photon counting type experiments.